I moved to Juneau, Alaska in 2006 and immediately fell in love with the beautiful surroundings. I am a self taught photographer. I find great inspiration in nature and love being outdoors. I am intrigued that many of my pictures capture a moment in time which will never quite be the same again due to the transient nature of the outdoor world. 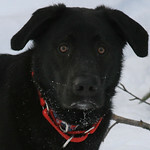 My black lab mutt, Apollo, and I love to go on wonderful outdoor adventures. We hope you enjoy our finds in the form of these photographs. Please check back often to see our latest photographs. In addition to being able to order prints from the website, I also hand make photo note cards and floating frames and have the 2013 calendars which are available for purchase as well. The prints are watermarked on screen but will not be printmarked when ordered from the website (there will only be a label on the back of the photograph but not on the front of the photograph). If you need help with anything else please contact me directly through the website or at britteny.cioni@gmail.com.